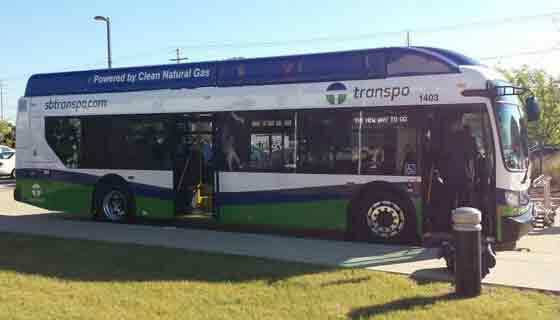 Last week we reported on Transpo’s purchase of sixteen new compressed natural gas buses. The new fleet comes from a company known as New Flyer, whose manufacturing plants are in Minnesota and Winnipeg, Canada. The New Flyer Xcelsior model will replace Transpo’s aging gas-powered Gillig Phantom buses. After reaching out to Transpo for comment, we have learned some new details about the deal. Transpo, which is responsible for 20 percent of the cost, will pay approximately $1.4 million for the new buses. The rest of the cost is covered with Federal Transit Administration funds. Aside from replacing 16 old buses in their 44 fixed route fleet, the main justification for the purchase was to produce long-term savings. In order to fuel the new compressed natural gas buses, Transpo is partnering with the city of South Bend to build the first fast-fuel compressed natural gas facility in the region. Construction on that facility will begin later this year with operations beginning in early 2015. It will be open to the public. Users currently have to flag a bus down along fixed routes. That will change once designated stops are put in place, similar to what is used in places like Chicago where stops are spaced every couple blocks. Buses would only stop when a rider requests a stop or when a passenger is waiting at one of the designated bus stops.